The American astronaut Neil Armstrong was the first person to walk on the moon. In one of the most famous remarks of the twentieth century, he called his first movements on the moon "one small step for man, one giant leap for mankind." 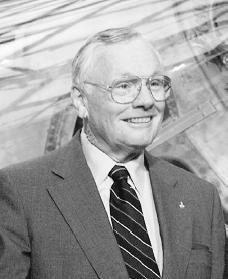 Neil Alden Armstrong was born on August 5, 1930, near Wapakoneta, Ohio. He was the eldest of three children of Stephen and Viola Engel Armstrong. Airplanes drew his interest from the age of six, when he took his first airplane ride. He began taking flying lessons at age fourteen, and on his sixteenth birthday he was issued a pilot's license. A serious pilot even at that age, Armstrong built a small wind tunnel (a tunnel through which air is forced at controlled speeds to study the effects of its flow) in the basement of his home. He also performed experiments using the model planes he had made. Through such activities he was preparing for what would be a distinguished career in aeronautics, or the design, construction, and navigation of aircrafts. Armstrong was also interested in outer space at a young age. His fascination was fueled by a neighbor who owned a powerful telescope. Armstrong was thrilled with the views of the stars, the Moon, and the planets he saw through this device. Armstrong entered Indiana's Purdue University in 1947 with a U.S. Navy scholarship. After two years of study he was called to active duty with the navy and won his jet pilot wings at Pensacola Naval Air Station in Florida. At twenty he was the youngest pilot in his squadron. He flew seventy-eight combat missions during the Korean War, a civil war from 1950 to 1953 between North and South Korea in which China fought on the Communist North Korean side and the United States fought to assist South Korea. After the war Armstrong returned to Purdue and completed a degree in aeronautical engineering in 1955. He immediately accepted a job with the Lewis Flight Propulsion Laboratory of the National Advisory Committee for Aeronautics (NACA) in Cleveland, Ohio. A year later he married Janet Shearon. Shortly afterward Armstrong transferred to the NACA High Speed Flight Station at Edwards Air Force Base in California. Here he became a skilled test pilot and flew the early models of such jet aircraft as the F-100, F-101, F-102, F-104, F-5D, and B-47. He was also a pilot of the X-1B rocket plane, a later version of the first plane that broke through the sound barrier (the dragging effect of air on a plane as it approaches the speed of sound). astronaut. His real love was flying planes. Largely because of his experience with the X-15, he was selected as a pilot of the Dynasoar, an experimental craft that could leave the atmosphere, orbit earth, reenter the atmosphere, and land like a conventional airplane. Armstrong continued his specialized training on the Gemini spacecraft and was selected as the command pilot for the Gemini 8 mission. With copilot David Scott he was launched from Cape Kennedy (now Cape Canaveral), Florida, on March 16, 1966. The Gemini 8 achieved orbit and docked as planned with another orbiting vehicle, but shortly afterward the Gemini 8 went out of control. Armstrong detached his craft, corrected the problem, and brought Gemini 8 down in the Pacific Ocean only 1.1 nautical miles from the planned landing point. Armstrong's cool and professional conduct made a strong impression on his superiors as the training for the Apollo program was developing. During a routine training flight on the lunar (moon) landing research vehicle (a training device that permits astronauts to maneuver a craft in a flight environment similar to that in landing on the Moon), Armstrong's craft went out of control. He ejected (forced out) himself and landed by parachute only yards away from the training vehicle, which had crashed in flames. With his usual controlled emotions, he walked away and calmly made his report. In January 1969 Armstrong was selected as commander for Apollo 11, the first lunar landing mission. On July 16 at 9:32 A.M. Eastern Daylight Time (EDT), Armstrong, with astronauts Michael Collins and Edwin Aldrin, lifted off from the Kennedy Space Center in Florida. Apollo 11 passed into the gravitational influence (pull of gravity) of the moon on July 18 and circled the moon twice. Armstrong and Aldrin entered a lunar module (a small spacecraft) named the Eagle, which then disconnected from the larger command and service module named Columbia. As they descended toward the lunar surface, their computer became overloaded, but under instructions from the mission control center in Houston, Texas, Armstrong managed to land the module. At 4:17:40 P.M. EDT on July 20, a major portion of the Earth's population was listening to Armstrong's radio transmission reporting that the Eagle had landed. At 10:56 P.M. he set foot on the moon, saying, "That's one small step for man, one giant leap for mankind." Armstrong and Aldrin spent nearly two and a half hours walking on the moon. The astronauts set up various scientific instruments on the surface and left behind a plaque (metal plate) reading, "Here men from the planet Earth first set foot upon the Moon. We came in peace for all mankind." Armstrong and Aldrin then returned to the Eagle and launched themselves to meet up again with Collins, who had been orbiting in the Columbia spacecraft. On July 24 Columbia returned to earth. Apollo 11 was Armstrong's final space mission. He joined NASA's Office of Advanced Research and Technology, where one of his main activities was to promote research into controlling high-performance aircraft by computer. In 1971 he began working at the University of Cincinnati in Ohio, where he spent seven years as a professor of aerospace engineering. Armstrong did continue some government work. In 1984 he was named to the National Commission on Space, which completed a report outlining an ambitious future for U.S. space programs. He was also a leader of a government commission to investigate the disastrous explosion of the Challenger space shuttle that occurred in January 1986. Armstrong has worked for several corporations since his astronaut days, including a position as chairman of AIL Systems, Inc., an aerospace electronics manufacturer. In 1999 he was honored at a ceremony at the National Air and Space Museum at the Smithsonian Institution in Washington, D.C., where he received the Langley Medal in honor of the thirtieth anniversary of the Apollo 11 mission. Armstrong also makes occasional public appearances at the Neil Armstrong Air & Space Museum in his hometown of Wapakoneta, Ohio. Aldrin, Buzz, and Malcolm McConnell. Men From Earth. New York: Bantam, 1989. Connolly, Sean. Neil Armstrong: An Unauthorized Biography. Des Plaines, IL: Heinemann Library, 1999. Kramer, Barbara. Neil Armstrong: The First Man on the Moon. Springfield, NJ: Enslow Publishers, 1997. This site is very informational. I have learned a lot about an amazing man! I am currently doing a solo talk on an inspirational person in English and this has helped tons. Thanks alot to whoever put it up! this website helped me alot with my powerpoint! this info was great! This really helped me ,and no i can get started on my essay!!! Thank you!!! This post helped me with my research project. Whoever post it up, thanks a lot! Whoa this wedsite is awesome even better than Wikipidea who ever posted this You are so so so so Damn AWWWEEESSSOOOMMMEEE!!! This is a greatest website ever. Great Info here. Whoever posted this has done so so so musch research and they have put it together so well... I have found so much information on Neil Armstrong and it has made my Biography 10 times easier...thanks so much. This really helped me with my paper! I love the person who typed this; they made my research project about Neil Armstrong so much! this really helped!I can now start my writing report on neil armstrong.Thanks to this article. This was really helpful for my school assignment thanks a lot to whoever put it up. This was awesome. So much information. this helped me make a biography on him. THANKS!